An iconic tourist must-do or a colossal waste of money? You decide. Growing up, I read volumes about the British Empire where the heroes were shipped overseas to some exotic location, made to work in the hot sun, and sometimes even learned to appreciate the cultures in which they were immersed. Therefore upon arrival in Singapore, I was more than excited to do the touristy thing and head to the Raffles hotel, even though we had a really busy time trying to get all the top Singapore sights on our itinerary. Named after the first governor of Singapore, Sir Thomas Stamford Raffles Raffles arrived around 1818 and decided there needed to be a British presence on the tip of the Malay peninsula. He set about building infrastructure and making a place British subjects could live. After he felt this job was done and he went home to London, he then founded the London zoo. 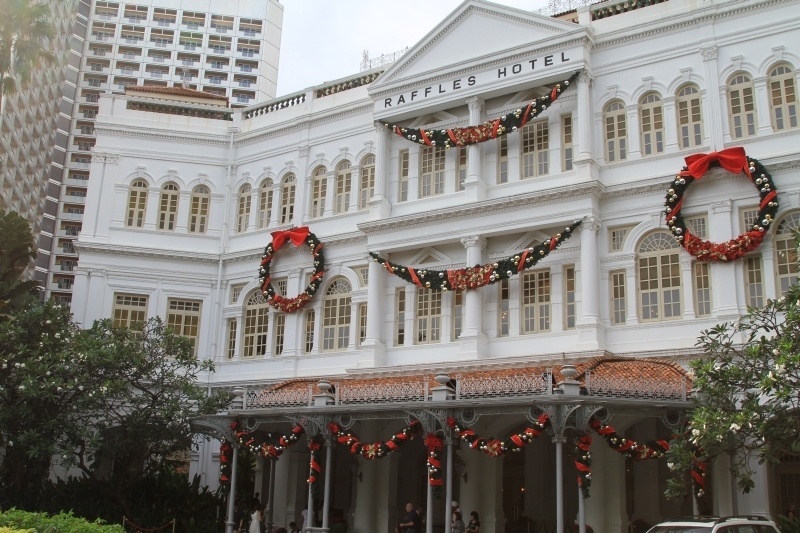 A pretty industrious gentleman, Raffles accomplished quiet a bit in his 46 years of life, and the luxurious Raffles hotel is only one of them. The hotel is all Victorian grandeur with a beautiful white-washed and colonnaded facade, sweeping verandas, and a precisely manicured landscape. Today it is dwarfed by all the tall buildings and malls that is downtown Singapore, but with such a large lot, you can certainly imagine how it dominated the city-scape of days gone by. 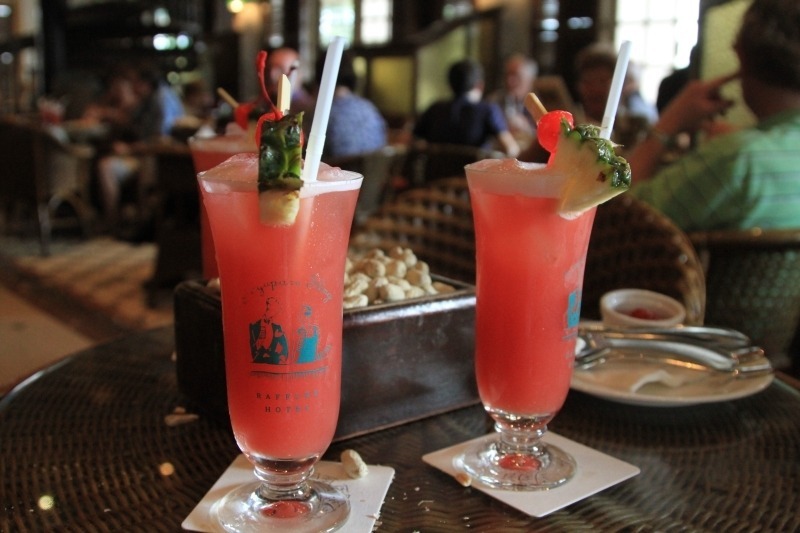 I’ve been to Singapore twice, and the first time was not during high tourist season, so my daughter and I were able to sit in the Raffles bar, enjoy our drink and take a breather from the oppressive heat and humidity that plagues the city-state all year round. It was quiet and elegant, tasty and cool; we loved it. Second time around, I was with Jim and my other daughter, Devon. We were hot; we were a little cranky. We needed a stiff drink and a respite from the concrete jungle. Unfortunately, this was not a unique notion. The bar was packed, but we finally spotted a table in the back. They had introduced the peanuts phenomenon well-known in chain western-style steak houses. What a mess! They had increased the price of the Singapore Sling to make it very difficult for the cheaper travelers (read me) to dole out the money. Twenty-seven Singapore dollars ($) for the drink alone, but there was a special for a full lunch that included a Sling for a mere 45. In Singapore that’s a pretty expensive lunch. However, we were hot; we were cranky, and we were getting a little peckish to boot. We still didn’t spring for three lunches. Are you kidding? But, we did share one and order the other two the drinks. It was definitely one of the more expensive touristy things we did during the trip. Was it worth it? Overall, I would say just don’t bother if you are on a budget! There are plenty of malls that are air-conditioned that will give you a nice cold drink or ice-cream and a chance to get out of the heat. I felt the old-world charm diminished with the entire peanut experience. Yes, there is history and yes, it was novel to have a drink where it originated, but I don’t think it was worth the price. Have you ever paid way too much for a lack-luster tourist activity? Where and when? 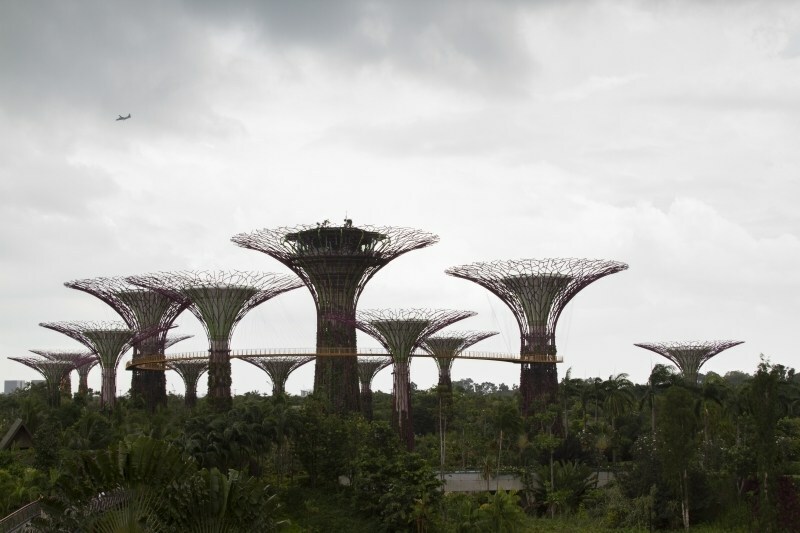 Gardens by the Bay, Singapore’s Highlight Attraction! Wow, gone up another S$! When I was last there in 2012, was already balking at the S$26 price tag. Do they still have all the other flavored slings as well? Brett, To be honest, I didn’t even look…sticker shock! When I started reading this I was disappointed that we missed this experience while in Singapore, but then I got to end and now I feel better about our choice. Rhonda, Yes. In my opinion, it has just gotten way too expensive! Lori, I agree. It is an experience, though. Mike, The hotel is gorgeous. It’s worthwhile to take a look around at it. I wouldn’t spend any more money there; I think street food is the much better idea! Wow, expensive! But it was lovely to see photos of Raffles. I went there 35 years ago when I was backpacking and we did have a gin sling, heavens only knows how we afforded it! But we did if I remember have some vodka in somebody’s rucksack too 😉 I loved it’s old world charm back then, but I’m sure it’s changed hugely. Johanna, I think the hotel still has loads of charm…but it just must cost a hefty bit to keep it so. My goodness, that is very expensive. I haven’t been to the Raffles during my many visits to Singapore as I’ve always had my 3 kids with me, and I didn’t think either the younguns or the establishment would appreciate us stopping there. I did manage to order a Singapore Sling at the hotel that we were staying at. It was much, much cheaper. Michele, Well, I think you’ve done well then. I would leave it at that! Jack, It can be expensive, but it was worth it!